Today we have a few more models from the Intel i9 range on the desk in the shape of the 14 core 7940X and the 7960X. I was hopeful that the 18 core would be joining them as well this time around, but currently, another team here have their hands on it so it may prove to be a few weeks more until I get a chance to sit down and test that one. Now I’m not too disappointed about this as for me and possibly the more regular readers of my musings, the 16 core we have on the desk today already is threatening to be the upper ceiling for effective audio use. The reason for this is that I’ve yet to knowingly come across a sequencer that can address more than 32 threads effectively for audio handling under ASIO. These chips offer 28 and 32 threads respectively as they are hyper-threaded, so unless something has changed at a software level that I’ve missed (and please contact me if so), then I suspect at this time the 16 core chip may well be well placed to max the current generation of sequencers. Of course, when I get a moment and access to the larger chip, I’ll give it a proper look over to examine this in more depth, but for the time being on with the show! Both chips this time around are advising a 165W TDP figure, which is up from the 140W TDP quoted back on the 7920X we looked at a month or two back. The TDP figure itself is supposed to be an estimate of the power usage under regular workloads, rather than peak performance under load. This helps to explain how a 14 core and 16 core chip can both share the same TDP rating, as the 14 core has a higher base clock than the 16 core to compensate. So in this instance, it appears that they have to some degree picked the TDP and worked backward to establish the highest performing, clocks at that given power profile point. Once the system itself starts to push the turbo, or when you start to overclock the chip the power draw will start to rise quite rapidly. In this instance, I’m working with my normal air cooler of choice for this sort of system in the shape of the BeQuiet Dark Rock Pro 3 which is rated at 250W TDP. Water-loop coolers or air coolers with more aggressive fan profiles will be able to take this further, but as is always a concern for studio users we have to consider the balancing of noise and performance too. 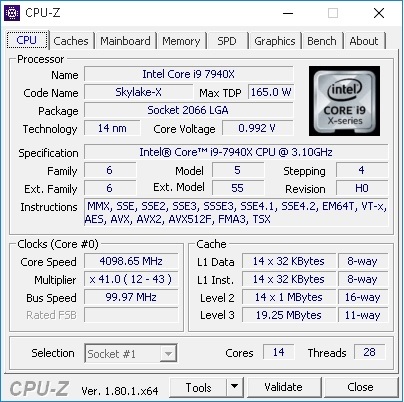 Much like the 7920X, we looked at previously, the chips are both rated to a 4.2GHz max two core turbo, with staggered clocks running slower on the other cores. 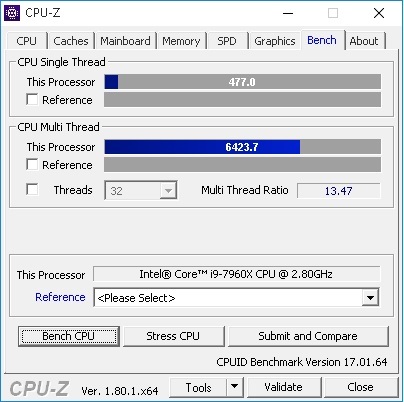 I took a shot at running all cores at 4.2GHz but like the 7920X before it we could only hit that on a couple of cores before heat throttling would pull them back again. Just like the 7920X again however if we pull both of these chips back by 100MHz per core (in this instance both to 4.1GHz) they prove to be stable over hours of stress testing and certainly within the temp limits we like to see here, so with that in mind we’re going to test at this point as it’s certainly achievable as an everyday setting. 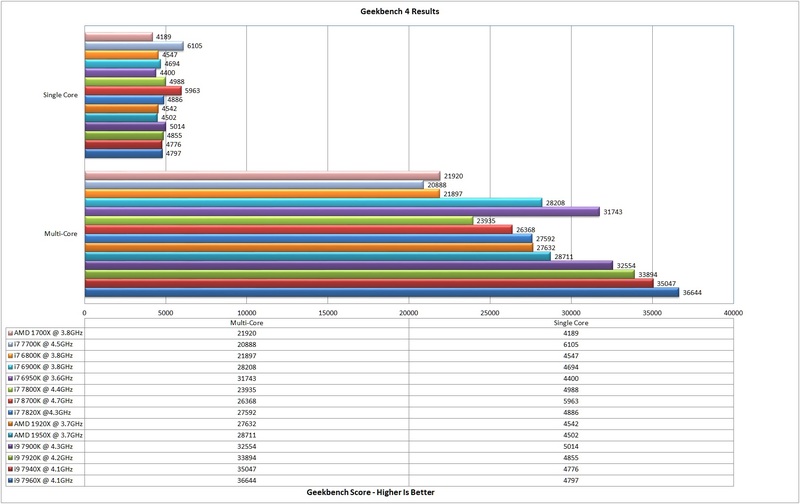 As always first up is the CPUid chip info page and benchmarks along with the Geekbench results. 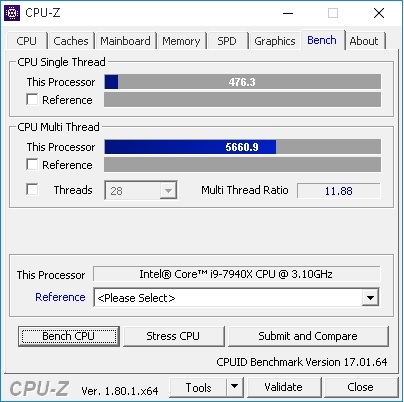 Both chips are clocked to the same level and the per-core score here reflects that. 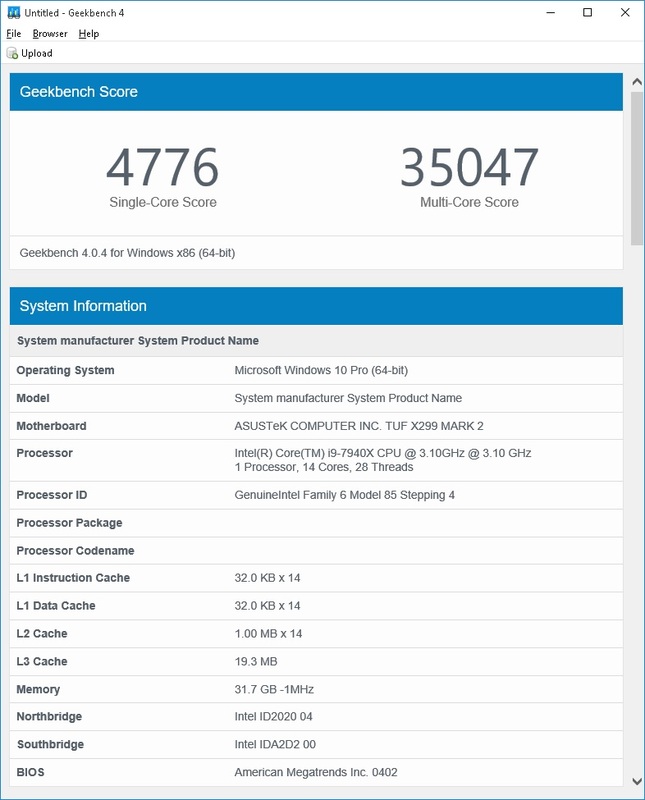 The multi-core score, of course, offers a leap from one chip to the other as you’d expect from throwing a few more cores into the equation. 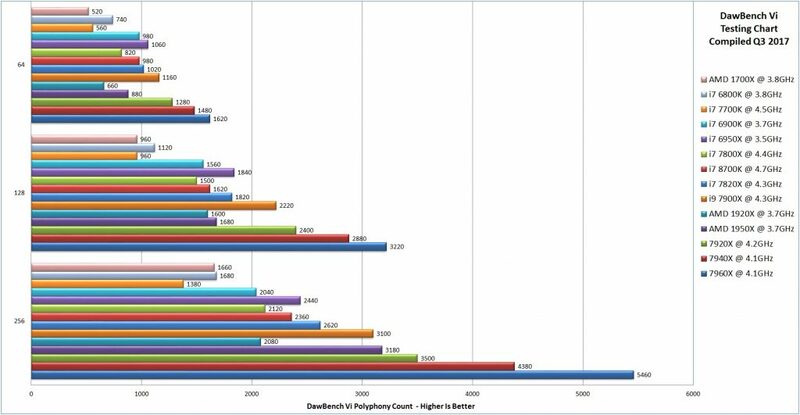 The DAWBench classic and newer DSP test with Kontakt follow this and once again as there isn’t a whole lot I can add to this. The added cores give us improvements across both of these chips as we’ve already seen in the more general purpose tests. 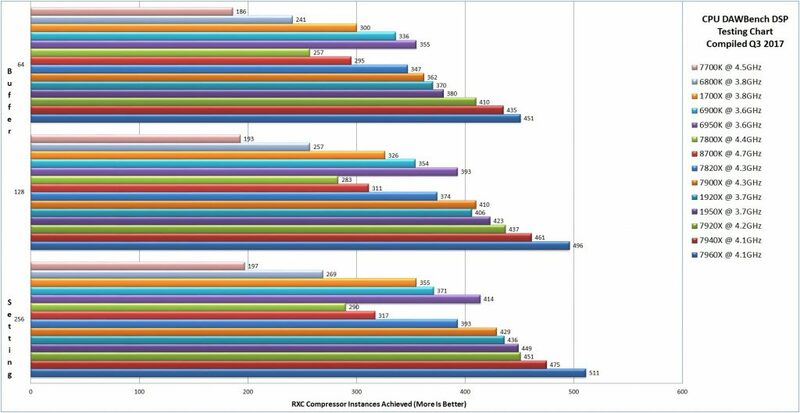 The 7960X does appear to offer a slightly better performance curve at the higher buffer rates, which I suspect could be attributed to the increase in the cache but otherwise, it all scales pretty much as we’d expect. 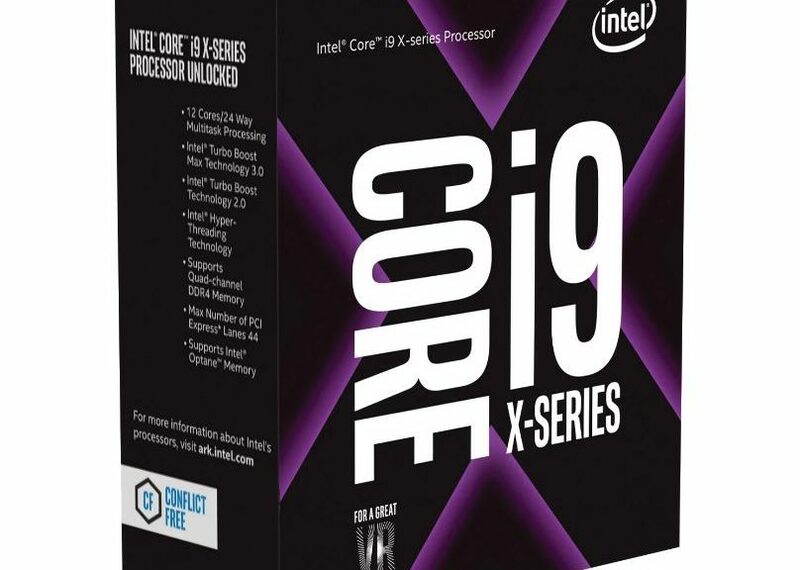 Given the 7940X maintains the roughly £100 per extra core figure (when compared to the 7920X) at current pricing that Intel was aiming for at launch, it does seem to offer a similar sort of value proposition as the smaller i9’s just in this case more is more. The 7960X raises this to roughly £125 per core extra over the 7940X at current pricing, so a bit of cost creep there but certainly not as pricey as we’ve sometimes seen over the years on the higher end chips in the range. The main concern initially was certainly regarding heat, but it looks like the continued refinement of the silicon since we saw the first i9 batches a few months ago has given them time to get ahead of this and ensure that the chips do well out of the box given adequate cooling. With the launch of the CoffeeLake’s in the midrange, some of the value of the lower end enthusiast chips appear to have quickly become questionable, but the i9 range above it continues to offer performance levels henceforth unseen by Intel. The’s a lot of performance here, although the price matches it accordingly and we often find ourselves at this time where more midrange level systems are good enough for the majority of users. However, for the power user with more exhaustive requirements who find that they can still manage to leverage every last drop of power from any system they get their hands on, I’m sure there will plenty here to peak your interest. Previous PostTips & Tricks: Kontakt Optimization – The Batch Re-save FeatureNext PostBudget Signature Model Guitars. Should They Really Be Called Budget?